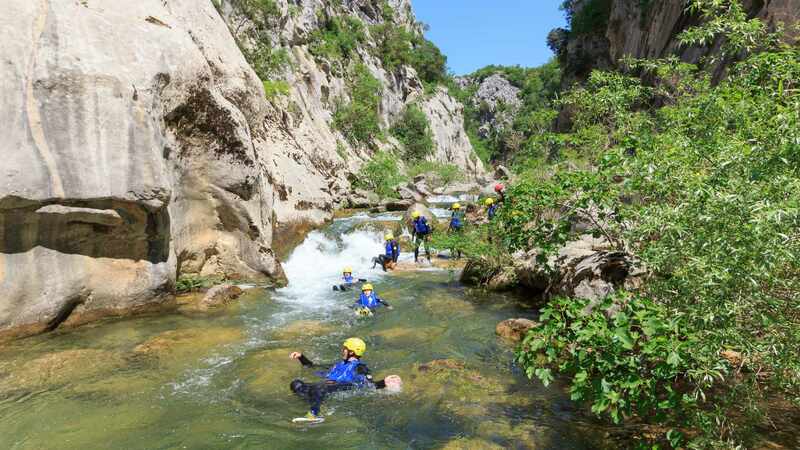 River Cetina canyoning adventure is one day adventure. Surely best activity you can find in this part of Croatia. The canyon is certainly characterized as extraordinary. Vertical limestone cliffs form the side of the river bed. Canyon height is up to 200 m.
The base of the canyon is covered by amazing rock shapes. River has been forming structures for thousands of years. There are special places with crystal clear pools. Also places with numerous rapids. Then half way down there is highest waterfall. This waterfall is also called or known as Velika Gubavica. Cetina canyon is about 2.5 km long. Canynon is suitably navigable for everybody. Despite or regardless of canyoning experience. Additionally at the finish point we just swim out of the canyon. Then we take a short walk to the transportation back. Push limits and feel adrenaline rush in your blood. Enjoy in natural canyon beauties and crystal waters. Dicover Cetina canyon and Croatia with us. In other words have fun. River Cetina canyoning adventure tours are for everyone. The river Cetina is 104 km long and dramatically winding through the Dalmatian countryside. The main spring feeds the Cetina emerges from under the Dinaric Alps. Other tributaries join it on its journey towards while estuary is in Omiš. Omiš is truly beautiful town. Town lies on Adriatic coast, 25km south of Split, and above all is worth a visit. River Cetina canyoning adventure take place near the village Zadvarje, 43°25’60.0″N 16°53’33.4″E . There we have our equipment base. It is also where the tour begins. On this part of the river the canyon is at its deepest and waterfall known as Velika Gubavica at their highest. The Cetina is especially famous for its crystal clear waters. River provides the drinking supply for people and waters the crops. Along the river there is no industry, no major towns or cities. Cetina river environment is largely secure. Therefore let’s protect the river and keep it that way! 55m drop is waiting for you!